Fancy a pair of jeans for under £1? Of course you do and that is why you will want to book mark this page. MandM Direct is one of the best online fashion and sports retailers and its Black Friday deals will be super crazy, there will be many great bargains on top of the amazing offer on jeans they had during its last Black Friday sales event. MandM Direct Black Friday deals are always super low but moving forward we can see many more bargains on brand names such as Levi’s, Diesel, Jack and Jones and many more. They will offer deals until they run out of stock, so once it’s gone it’s gone so to speak. To make sure you do not miss out we will list the top MandM Direct Black Friday deals below, and you can also add any discounts you come across within the comments area if you please. So, if you fancy trainers, shoes, jeans, jackets or anything else keep checking back here. You’ll be able to see all the MandM Direct special discounts on their Black Friday offers page. You can now save £40 on the Mens Lacoste Straightset SP Chukka Trainers in Grey, they are now only £34.99. The M&M Direct Black Friday Price Drop Sale is now on, 3800 prices have been lowered. Loving the massive savings on Timberland right now. The M&M Black Friday deals will be going live on November 23rd this year of 2017. There deals will be running for a week. Whoa, am i reading this right? M&M Direct is selling a pair of Hunter Womens Original Tall Dazzle Wellington Boots in lavender colour with a huge £130 saving. The price was £164.99 but now only need to pay £34.99. Save £80 on the womens Adidas Adizero Adios Boost 2 Lightweight Neutral Running Shoes, now only £29.99. The Cheap M&M Direct Black Friday Deals have gone live. Once its gone its gone is the motto here. The website says it will have new deals in 16 minutes. I am loving the Ralph Lauren Mens Sunday Scuff Slippers for just under £25. 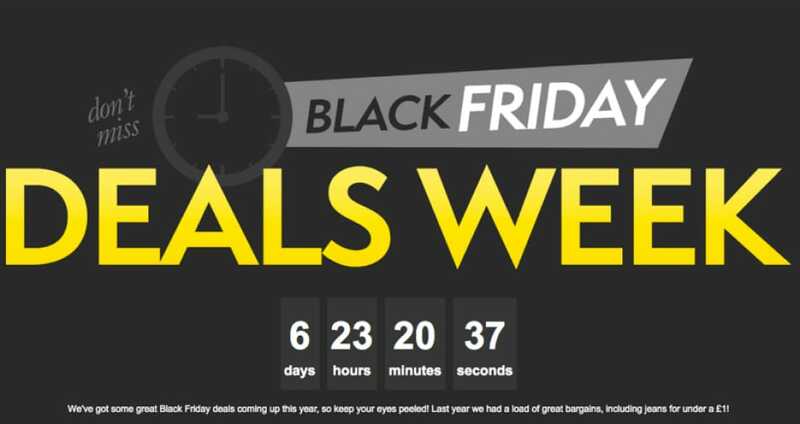 M&M Direct Black Friday deals are now live on the official website, they are calling it deals week where 9 new deals twice a day will appear from 9am until 5pm. Save up to 65% on brand name trainers. Such as I just purchased some Adidas Gazelles for just £54.99 reduced from £74.99. M&M Direct are more than likely going to have the same Black Friday sale they had in 2015, it is going to be a whole week of deals baby. Get up to 70% off boots over at MandM online, they are also doing many other deals as well so go take a look see what you fancy. I just saved £25 on the cool coral coloured Soulcal Womens Zip Thru Hoody, now only riced at £24.99 – product code at M&M SR63SQ92. Massive MandM sale is on right now. Up to 70% on items and much more. Save a cool £25 on the adidas Mens Messi 10.4 TF Astro Boots in black, red and white. Was £44.99 NOW only £19.99. This week is M&M Direct sports week where you can get up to 80% off – welcome to the BIG Brand Football sale. I have bought a lot of gear and saved a lot. Get up to 70% off trainers at M&M Direct, you can save a lot of money such as save £55 on the mens Adidas Purboost might camo running shoes priced now at only £44.99. Today only at M&M Direct you can get 20% off over 5000 products, this is an extra 20% according to the site. They also have a section where everything is half price or less as well as 60% off Jack Jones, up to 75% off gifts , half price jackets and boots and much more. I went to school in London called Pimlico and was only talking about it with my wife, it was a little of a coincidence seeing M&M Direct online store selling the men’s crosshatch pimlico knit top. To make it even better i just bought it for just under £10 saving myself £30. I just saved a huge £50 on the brown Voi Jeans Mens Delta Boots, i only paid £9.99 this is crazy cheap. I just saved £70 when buying the adidas Mens Crazylight Boost Basketball Shoes, the ones i bought were like red black and white i paid a mere £50. I just saved £60 on a pair of honey Caterpillar Men’s Stickshift Work Boots, i just paid £39.99. The M&M Direct Footwear Flash Sale is one right now, this is only on for 2 days so hurry whilst you can. Get bargains such as Rockport Mens Charson Chukka Boots in dark brown for only £51.99 that is after the huge £48 saving.